Finding consistency in T20 cricket appears to be almost as difficult as facing Muhammad Azharullah in the final over of an innings. Very few teams are able to string wins together and remain unbeaten for any period of time. But until last Saturday, Northants Steelbacks had come up with a magic formula. It was fuelled by an inner belief that they would win games, even if that meant going right to the final ball. With Azharullah hitting his straps again, they had secured four wins in five games, with the other a washout at Leicestershire Foxes. They were winning then as freely as they were losing at the start of a campaign that began with three successive defeats. David Ripley’s men had found that elusive consistency, but now they want to ensure that their North Group journey does not end with a bad run. They will be desperate to bounce back immediately at Derbyshire Falcons on Sunday (start 2.30pm), with the table as a tight as a duck’s proverbial. “I haven’t seen the table,” stressed Ripley, whose side were beaten by seven wickets at Nottinghamshire Outlaws last Saturday. “I’m not over fussed about having a look at it really until we get towards the end. “We’ll just try and concentrate on winning our games if we can, of which the next one will be a tough game at Derby. “They beat Notts recently, but I think they’re below us in the league so they’ll look at beating us and getting up alongside us. 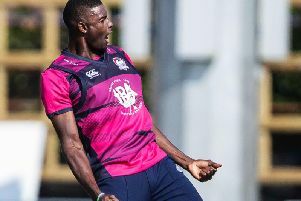 Derbyshire have been more miss than hit in this season’s NatWest T20 Blast, but they did impress when beating the Outlaws last weekend, before being on the end of a Brendon McCullum-inspired mauling at Birmingham Bears on Friday night. And Ripley believes that the Falcons, who lost at the County Ground earlier in the competition, will pose a real threat. “Everyone’s got their match-winners in their side,” said the Steelbacks head coach. “You’re looking for your match-winners to kind of come to the party and win you some matches. “We’ve done well with that over the last five games but it’s who performs well on the day. Sunday’s match is being played at Queen’s Park in Chesterfield, and is the first fixture in Derbyshire’s annual Autoworld Volvo XC90 Chesterfield Festival of Cricket. Derbyshire have named an unchanged 12-man squad from the one beaten at Edgbaston on Friday, with Birmingham Bears’ Brendon McCullum hitting an incredible 158 not out to sink the Falcons, while the Steelbacks will be without the injured David Willey and are likely to stick with the 11 that lost at Trent Bridge last weekend.